You’ve probably been wondering what those codes mean in Cal North’s Data Management system in reference to your coaches/team managers/Assistant Coaches, etc.., or printed on your coach’s pass. 1) Click on Leagues in the left navigation. Select your league from the drop down. 2) Click on Registration> Age Override> and then the level of play you’d like to configure requirements for. 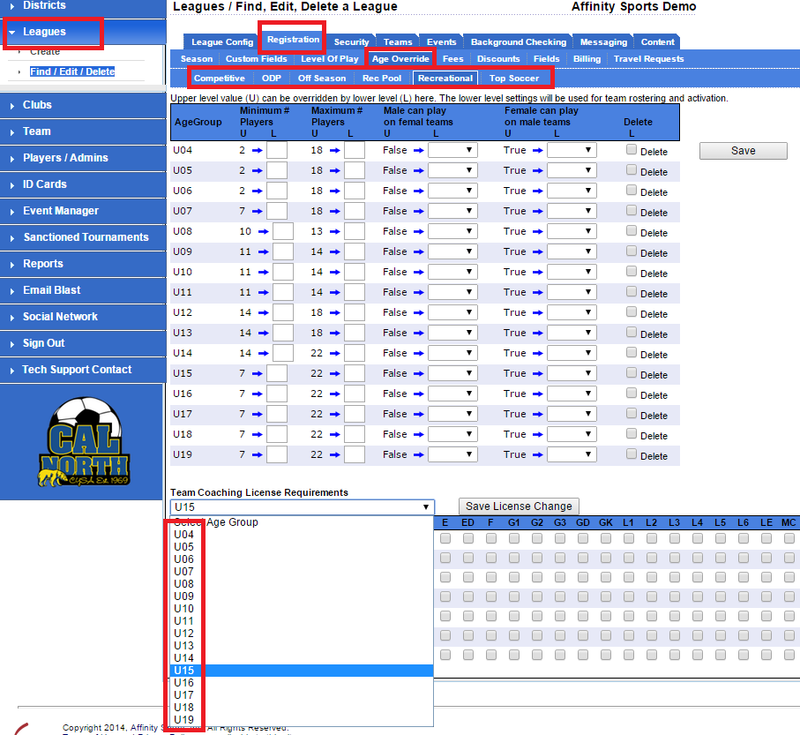 3) Using the drop down at the bottom select the age group you’d like to configure a requirement for. 4) For each of the administrator types, check off the licenses that would meet your organizations coaching license requirement, and save those changes. Here is a screen shot of the configuration page. Outlined in red are the menu items you’ll need to click to navigate to this page. By configuring a coaching license requirement, a coach without the necessary credential/license will prevent their team from being activated. The Coaching Program has worked hard to provide an intelligible list of coaching codes. The codes are listed below, and up to date as of this posting (11/24/2014). USSF F License F USSF approved Curriculum License Coming Soon!